During increased neuronal activity, vasodilation occurs in the active brain areas. The concept of neurovascular coupling has already been postulated in the 19th century by Roy and Sherrington (for reference see ). From their observations Roy and Sherrington postulated that "unknown signals" during increased activity of neurons in the brain induce regional vasodilation and increase of blood flow. Despite extensive research these signals are still not fully understood. In addition, relevant aspects of the different temporal and spatial kinetics of cellular energy metabolism and oxygen consumption leading to the observed complex changes in regional cerebral blood oxygenation have remained enigmatic. Nevertheless, the vascular changes based on the phenomenon of neurometabolic and neurovas-cular coupling are widely utilized under experimental and clinical conditions by modern techniques providing non-invasive functional brain imaging, where they serve as surrogate markers for neural activity. 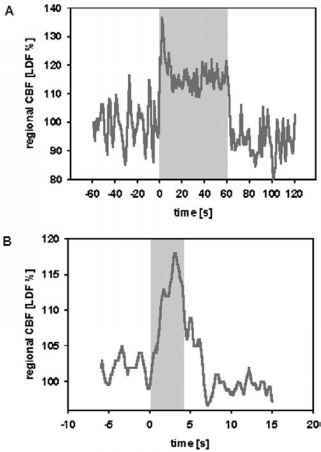 The regional CBF is spatially as well as temporally coupled to brain activity. Studies on neurovascular coupling are therefore mainly focused on changes within the cerebral microcirculation. When neurons are further activated from resting state activity, within the first 1 to 2 seconds regional CBF increases. It reaches a peak response after 3 to 5 seconds, followed by a plateau somewhat lower than the peak response during ongoing neuronal activity, as shown for the cortical blood flow response during somatosensory stimulation of the whisker system in rats . When stimulation stops, CBF returns to baseline within several seconds, and a transient small undershoot can irregularly be detected. A typical example of microvascular blood flow changes due to functional activation by 60 seconds (A) or 4 seconds (B) of whisker hair deflection in the anesthetized rat is provided in Figure 1.
providing higher spatial resolution. In olfactory bulb glomeruli of anesthetized rats, it has been shown that during short periods of odor-evoked neuronal activation, a transient and reproducible increase in red blood cell flow in capillaries within the odor specific glomerulus occurs. This increase is largely caused by an increase in red blood cell velocity and only partially accompanied by an increase in linear density of red blood cells. Vascular responses occur as early as 1 to 2 seconds after the neuronal response within the glomerulus. In the olfactory bulb, the arteriolar network penetrating into glomeruli from the surface does not exhibit any precise organization that could provide an arteriolar-based regulation of the glomerulus-specific vascular responses to odors. 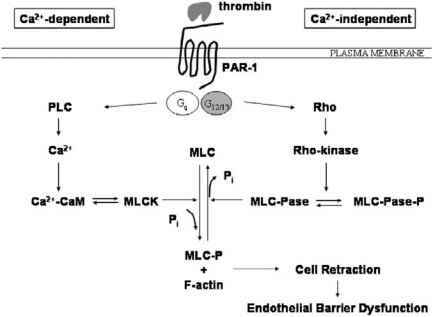 These findings provide first functional evidence for the hypothesis of a local capillary regulation of microcirculatory blood flow within activated brain areas .